Procrastination. We're all guilty of it. Even me. You'd think that self acknowledgement would improve things but if my expired passport is anything to go by, apparently not. That was the main reason for publicly acknowledging in my new year resolutions that this year things are going to have to change, not only for my own sanity but also to hopefully aid my ascent from the rut which life seems to have settled in to. 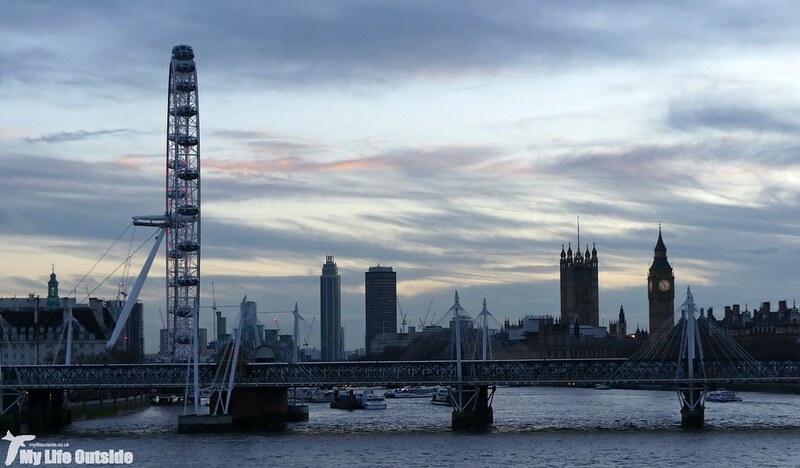 Take London as a prime example. We first discussed making a weekend trip a couple of years back to see either We Will Rock You or Rock of Ages in the West End. Leaving our musical tastes aside this seemed like a great idea yet somehow we never quite managed it. Both shows have since closed, another missed experience, so weekend before last we decided that enough was enough. A quick internet search later and we had hotel and train tickets booked and, less than half an hour after leaving work, we were being whisked towards the capital aboard that stalwart of BR, the Intercity 125. Bang on time we arrived at Paddington and following a brief navigational error we were soon standing mid span on Tower Bridge taking in the lights, sights and sounds of central London. Why had we taken so long. This was fantastic! Across two days we walked over twenty miles covering all the main tourist landmarks including the British and Natural History museums, Tate Modern (I don't understand modern art it's safe to say) and even managed to squeeze in purchasing a sausage roll from Harrods. 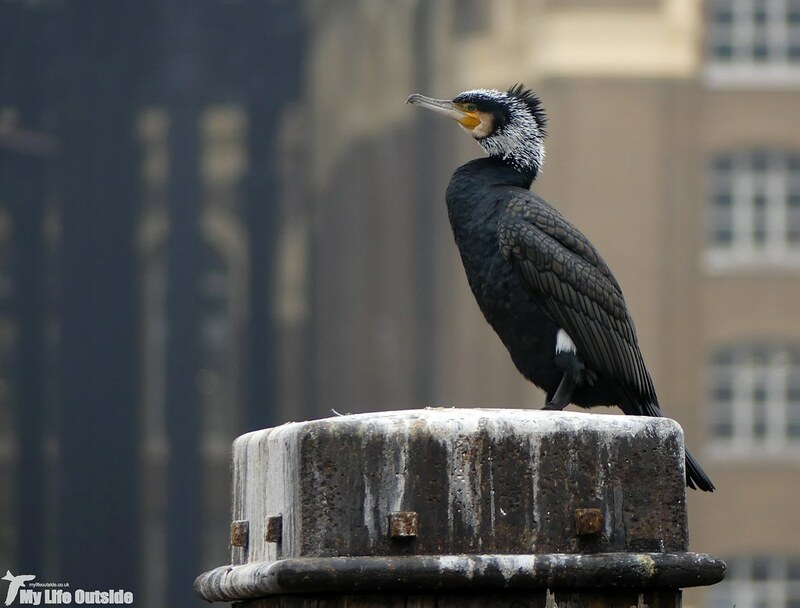 Fear not though, this post is not going to be a rundown of London's famous vistas but will instead focus on the surprising array of bird species which call the city home. Even during that first evening we could hear the calls of Black Headed Gulls from the river to which we were soon to add Herring, Common, Lesser Black-backed and Great Black-backed. Who needs the seaside eh. They didn't have the Thames to themselves however as apart from the ubiquitous Feral Pigeons there were also several Cormorants including a couple in full breeding plumage. This individual in particular stood out, perched atop one of the old mooring points opposite Hay's Wharf. 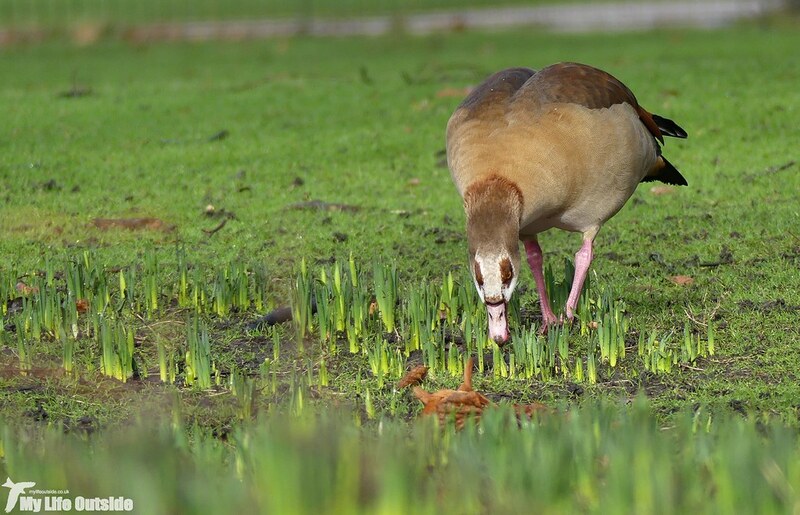 Their quiet demeanour was in strong contrast to our next sighting, a trio of Egyptian Geese who were either wildly enthusiastic at each others presence or ready to start world war three. It was hard to tell which. 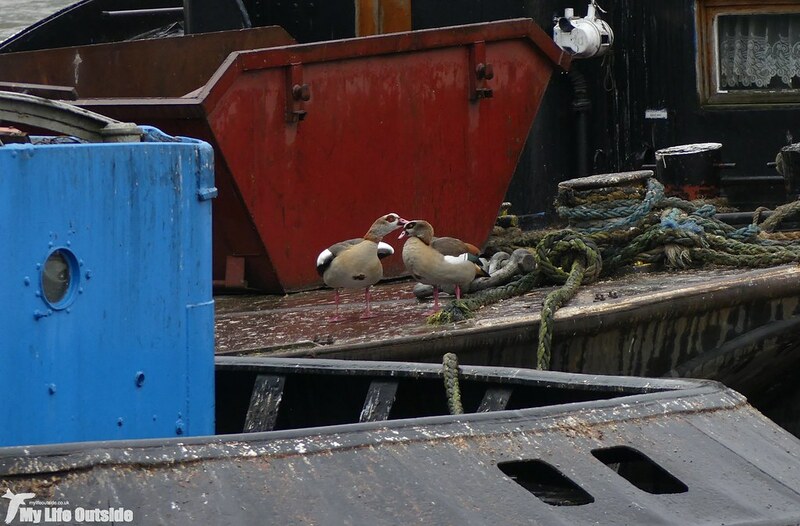 After circling around for a bit two eventually settled on a barge moored mid-channel and embarked in what appeared to be courtship. 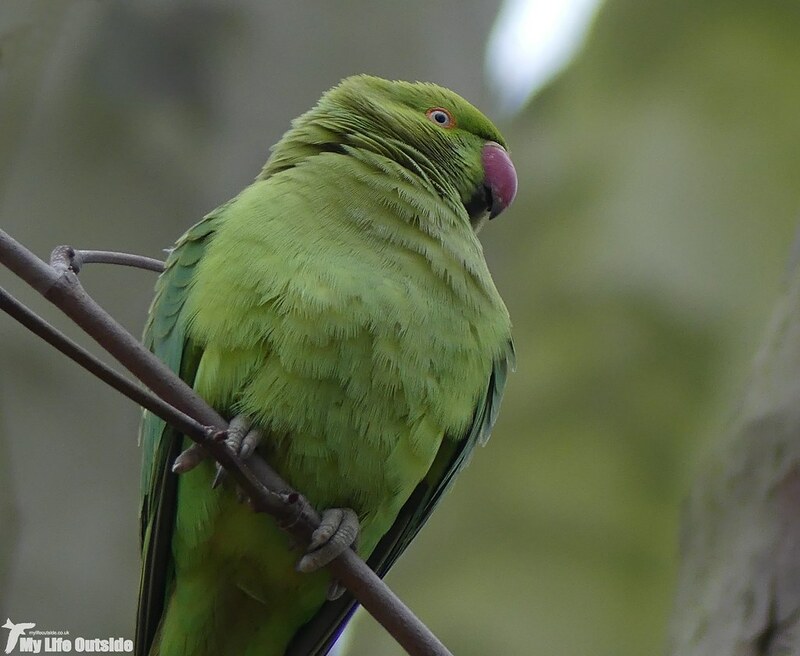 Having only really come across these birds in Norfolk previously, finding them in central London came as something of a surprise. They've clearly taken the place to heart however as there were several more in St James park, all equally as bad tempered as the first. At least they seemed happy to pose for photographs and I got my best shots to date of these curiously plumaged birds. Some would say ugly, I prefer unique. 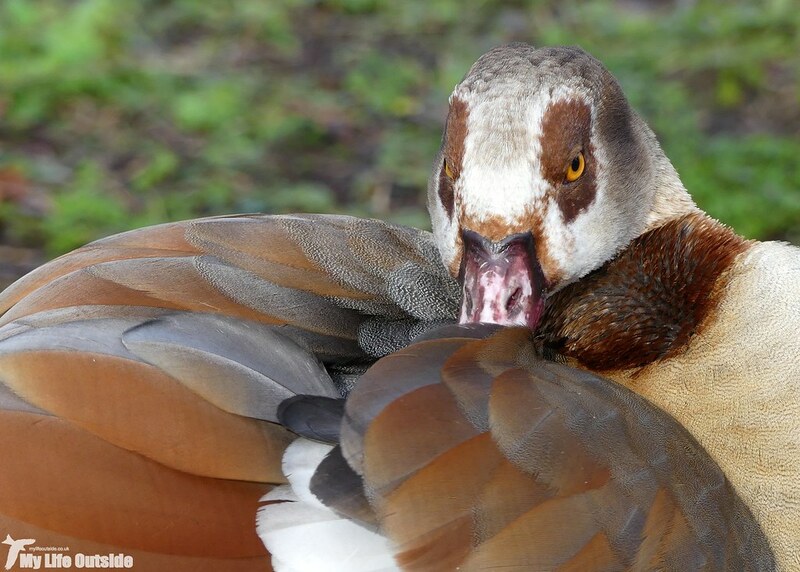 They weren't our last surprise either as St James park also held a decent collection of waterfowl. 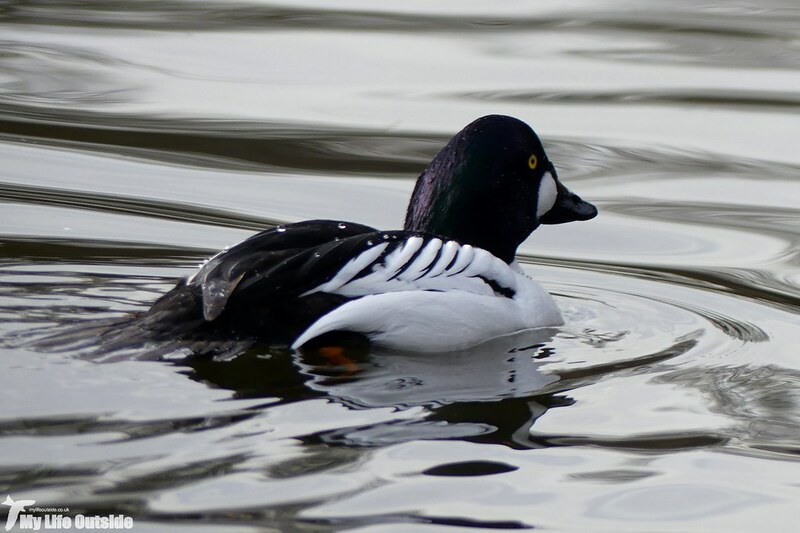 Picking the wild birds from captive was tricky but we ended up spotting Gadwall, Shoveler, Tufted Duck, Coot, Moorhen, Mallard, Canada Goose, Pochard, Little Grebe and even a male Goldeneye (which delighted in giving me the run around), all within touching distance of Downing Street and an anti-Trump march. 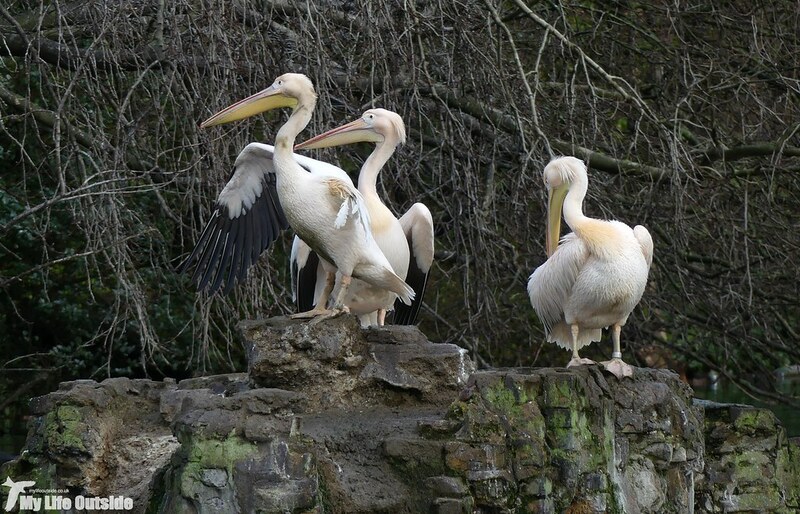 Then of course there were the famous Pelicans though these are anything but wild. First introduced in 1664 as a gift from the Russian Ambassador they certainly made for an impressive sight and look very good for their age. 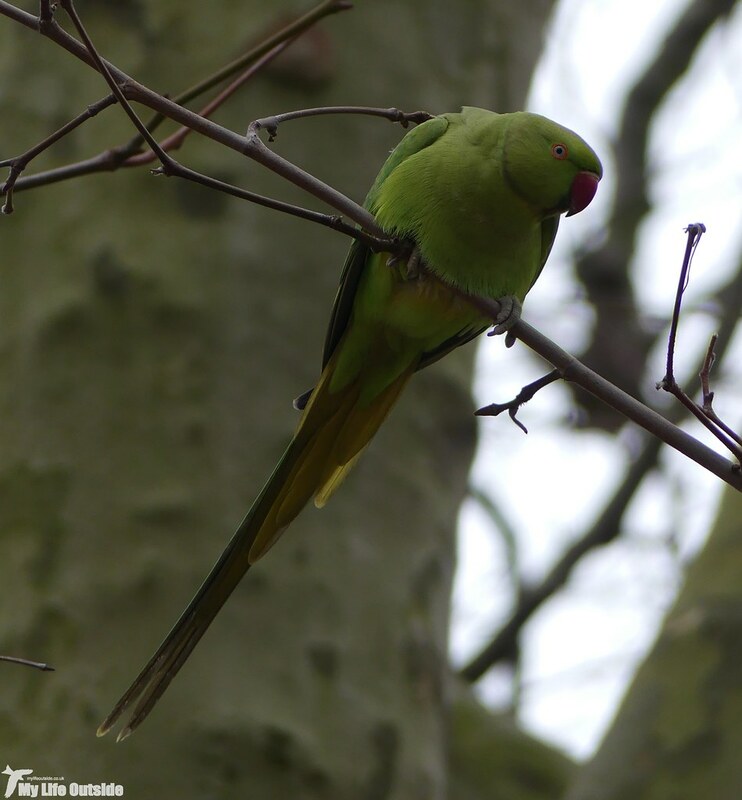 Of course we couldn't visit London without at least one sighting of Ring-necked Parakeets and on that score St James' once again delivered. Their calls belied their presence long before we spotted one and from that point on they were a constant companion until we were well past Buckingham Palace. In poor light and always quite distant photography proved difficult but fortunately we hit pay dirt on a grey and foggy Sunday morning in Greenwich. There a flock of at least eight birds were chilling out in trees near the old navy buildings allowing some great views and a close approach. Once again these are my best shots of this species to date, but oh for a little sunshine. Probably the only thing missing from our collection was a bird of prey, something which would once have been common in the days when Red Kites were considered vermin such were their numbers scavenging in the streets. 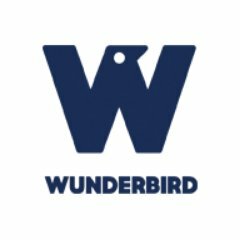 We'll probably never get back to that state now that sanitation and cleanliness are all the rage but nevertheless, if you've ever thought that urban areas offer little in the way of bird life then think again. 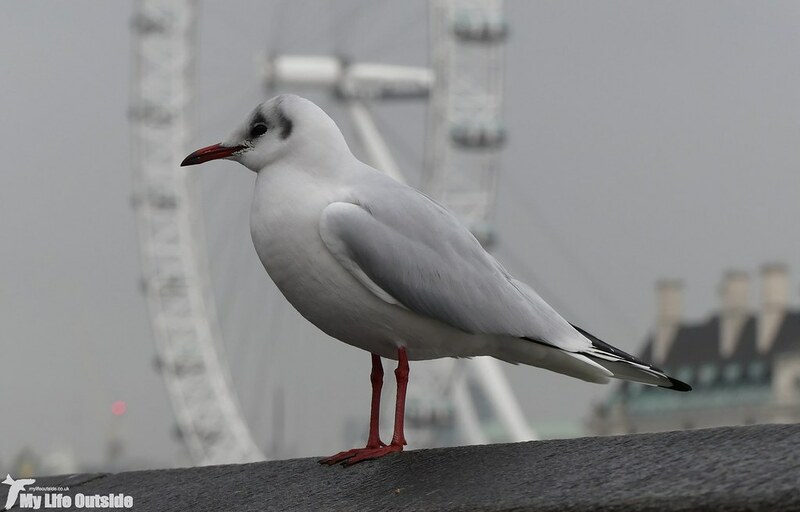 All that's left for me to do really is to finish off with the species that started it all, a Black Headed Gull outside the Houses of Parliament. I wonder what its views are on a Trump state visit! Wow great photos, I do love a bit of urban adventuring. 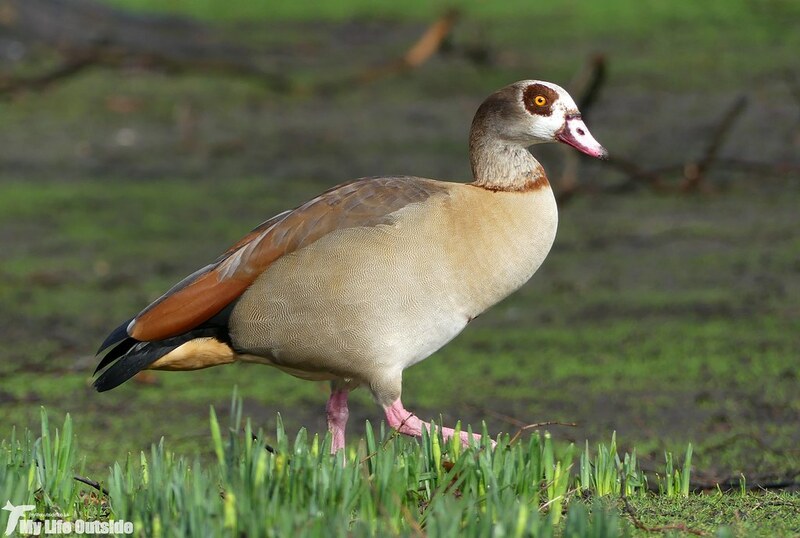 I also love the Egyptian geese, I don't think they're ugly at all! Love the industrial/bird photos, always an interesting combination.